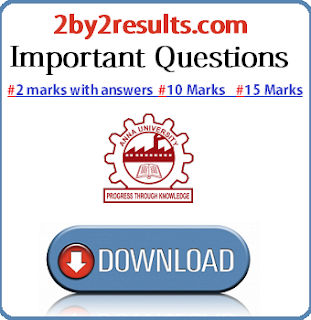 Download Anna University Information Technology Important Questions from 2by2results.com. Here We have provided the B.Tech Information Technology (IT) Important Questions for 1st 2nd 3rd 4th 5th 6th 7th 8th Semester. 2by2results.com Important Questions for Information Technology Department is prepared by Experienced Staffs. Here We provide Part A, Part B & Part C Important Questions for all Subjects. Hence These questions are considered to B.Tech most Important questions. With the Above Link you can download Anna University Information Technology Important Questions for both Odd and Even Semester. We have provide Information Technology Important Questions for 2 marks, 10 marks and 15 marks as well. We request Students to make use of the 2by2results.com Important Questions and share it also with your friends.